Transportation Services has partnered with CTA to allow students, faculty, staff, and anyone else with valid Northwestern University photo identification to ride the Chicago Transit Authority's #201 bus for free during the academic year, September 1 through June 30. 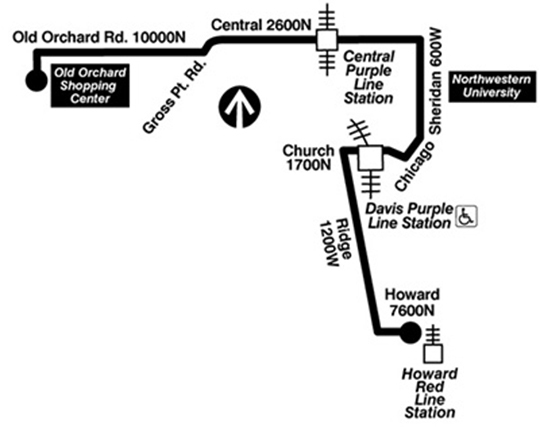 The #201 bus route operates between the CTA Howard station and Old Orchard Mall with stops in downtown Evanston, on campus, at Ryan Field, and extending along Central Street. If you have a U-PASS: If you have a U-PASS, please continue to use it as normal to access the #201, rather than displaying your Wildcard. Your U-PASS has already been paid for and provides unlimited travel on CTA's bus and rail system. If you do not have a U-PASS: If you do not have a U-PASS, simply present your Wildcard to the CTA bus driver to ride. This free access is valid only for the #201; Wildcards will not be accepted on any other CTA bus routes. Weekdays: 5:00 a.m. to 8:00 p.m.
Saturday: 9:10 a.m. to 7:10 p.m. Weekdays: 5:50 a.m. to 8:00 p.m.
Saturday: 8:55 a.m. 7:15 p.m. This map shows the normal pattern for service along this route.